The What: Shure’s Microflex Advance Ceiling (MXA910) and Table (MXA310) Array microphones are now shipping. This portfolio of premium networked ceiling and table array microphones, audio interfaces, and control software for enhanced AV conferencing are designed to integrate easily into premium meeting space aesthetics. The What Else: The MXA910 is a premium networked array microphone that captures clear audio from above the meeting space with Shure proprietary Steerable Coverage technology, enabling up to eight lobes that are configurable in three dimensions. Designed for AV conferencing environments, from boardrooms to huddle rooms, and multipurpose spaces, the MXA910 can be flush-mounted in any standard ceiling tile grid. In addition, the MXA910 can also be installed below the ceiling with standard VESA-D and wire hanging mounts. The MXA310 captures high-quality audio and provides flexibility in varying AV conferencing environments. 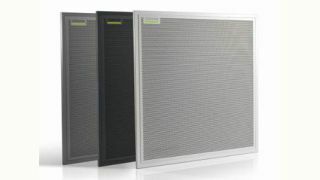 Within the onboard IntelliMix DSP Suite, the company’s proprietary Steerable Coverage technology deploys up to four discrete audio channels around a table and uses an innovative new “toroid” ring-shaped pattern to reject unwanted artifacts from overhead such as HVAC or projector fans. Programmable capacitive-touch mute switches ensure simple user operation with the ability to customize LED color and shape to indicate microphone status. Offering easy and efficient analog to digital/digital to analog conversion, the four Shure Audio Network Interfaces (ANI4IN and ANI4OUT) are also shipping and provide audio routing in and out of the Dante-networked audio domain. They are available in standard XLR (mic/line) and block (mic/line) connector versions that include LED and mute switch pins for logic-enabled analog microphones. All Audio Network Interfaces include a single ethernet port for easy Dante audio routing and a browser-based software for control of connectivity and monitoring. Microflex Advance presents an enhanced evolution of the company’s IntelliMix Digital Signal Processing Suite, including Steerable Coverage technology, enabling accurate control of audio capture in any location within a meeting space. All Microflex Advance hardware offerings feature built-in control software, providing an intuitive interface to simplify the process of adjusting microphone attributes, such as configuration of presets, templates, and polar patterns. The products also integrate easily with third-party controllers such as Crestron and AMX. The Bottom Line: With the ability to flush-mount the MXA910 alongside standard ceiling tiles, and the innovative "toroid" polar pattern in the MXA310, these microphones offer a package of technologies designed to ensure a best-in-class audio experience.